The latest statistical bulletin monitoring long-term health inequalities shows some stabilisation in relative and absolute terms. However, huge inequalities remain that requires a comprehensive strategy to tackle inequality. The amount of their life that people could expect to be in poor health was much higher in the most deprived communities, where men and women can expect to spend 22.7 years and 26.1 years respectively in “not good” health. 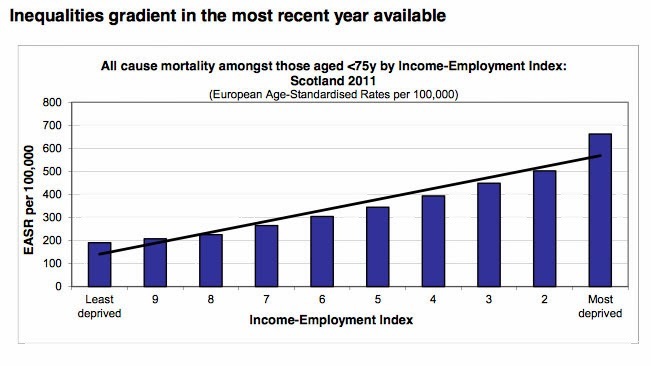 That compares to just 11.9 years and 12 years for men and women in the most affluent parts of Scotland. · Healthy life expectancy at birth: There continue to be inequalities in relative and absolute terms. Between 2009-2010 and 2011-2012. · Premature Mortality (under 75 years): Following a long-term increase, relative inequalities have stabilised since 2006. Inequalities have declined in absolute terms over the last decade. · Mental Wellbeing: Inequalities are increasing in absolute terms but remain stable in relative terms. · Birth weight: Inequalities are now stabilising in both absolute and relative terms. · Hospital admissions for heart attack (under 75 years): Over time, inequalities have fluctuated in both absolute and relative terms, with a general upward trend since 2008. · Coronary Heart Disease – deaths (45-74 years): Following a long-term increase, inequalities have stabilised in relative terms. In absolute terms, despite a slight increase in the latest year reported, inequalities have been narrowing. Hospital admissions rate for heart attacks was approximately 2.5 times higher in the most deprived areas than the least deprived communities. 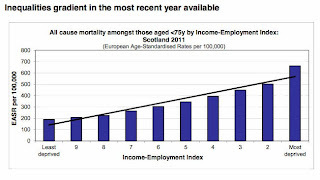 · Cancer Incidence and deaths: Over the long term, inequalities are more stable sine 2004. Patterns of inequality vary by cancer type. People aged between 45 and 75 in the poorest communities were more than twice as likely to die from cancer than those in the least deprived areas. · Alcohol – The level of absolute inequality has fallen since 1997, while relative inequality has remained stable over the same period. These types of admissions are more common in deprived areas – 493 per 100,000 population compared to 89 per 100,000 population in areas of low deprivation. · All-cause mortality aged 15-44 years: The level of relative inequality has increased since 1997 but in recent years has been more stable. Absolute inequality shows no clear trend over time. Following this report the BMA joined calls for action to tackle health problems in deprived areas as because the gap between rich and poor has “never been more apparent”. In particular they called for all policies to be assessed to examine what impact they would have on health inequality. Public health minister Michael Matheson said that reducing the health gap between rich and poor was “one of our greatest challenges”. He blamed welfare reform as a barrier to improving incomes. Predictably, all would be well if we vote for independence. However, the BMA's Dr Keighley said, people were “living healthier and longer lives”. But he added: “For those people living in the most deprived communities the inequalities in health have never been more apparent. We cannot simply continue to argue that public health policies are working to improve the lives of Scots when the differences between rich and poor are so apparent. No matter how many taskforces and inquiries politicians establish they are no substitute for action." It’s hard to disagree with that analysis.